Yaki Edamame ('焼き枝豆', is classified into appetizer), is known as Grilled Green Soybeans in English, and 烤毛豆 (Kǎo máodòu) in Chinese. It is the washoku. 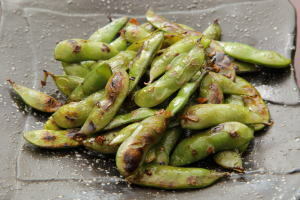 Yaki Mame, Grilled Edamame Beans.